First, you have to brown your beef in a skillet. When that is cooked through drain the extra "juice" out of the pan. Add the chopped onions and oil and cook the onions. Preheat the oven to 350 degrees F and add the garlic powder, hot sauce, cumin, cilantro and the salt and pepper to taste. Now, you are going to get out your tortillas and lay them in a pile. You will layer them with rice, beef, and some of the cheese. Roll them up and put in the baking dish. Repeat til you have all 8 tortillas in the dish (you may have to smoosh them in, but they will fit). Pour the cup of tomato sauce on top of the tortillas in the baking dish and spread it to cover them. Sprinkle with some salt and pepper to give it some flavor and cover with the remaining cheese. Bake for about 15 minutes, or until the cheese is melty. Now to eat them! An awesome way to top them is with fresh-squeezed lime juice and sour cream. Yep, wanted to point out like someone else did that the ingredient/amounts list is missing. I too think you should get a gold star for using the word "smoosh". 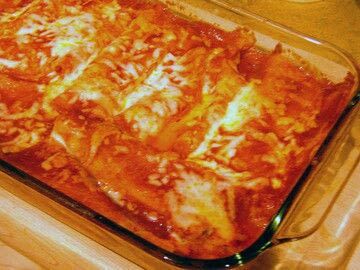 if i werent pulling a double tonight (-.- ), id SO be making these for dinner. maybe over the weekend!?!?! hehehe. Extra internet points for usage of the word "smoosh"
Can we have a full ingrediants list please? And amounts of weight for each?